Fay Williams lost 2st 6lb* with LighterLife after appearing on a hit Channel 4 TV show. “Early in 2018 I was scrolling through Facebook and a post popped up to say Channel 4 were looking for dieters to lose weight alongside a friend or work colleague. That’s when my friend from work, tagged me in the comments and encouraged me to participate with her. I didn’t think anything would come of it but to my surprise the producers wanted to meet us over Skype. It was quite surreal; one minute we were chatting over the computer, the next we were in London signing up. Within a month I would embark on my weight-loss journey, and I was excited about getting started. Having struggled with my weight from a child, I was very familiar with slimming clubs and following calorie-controlled recipes. 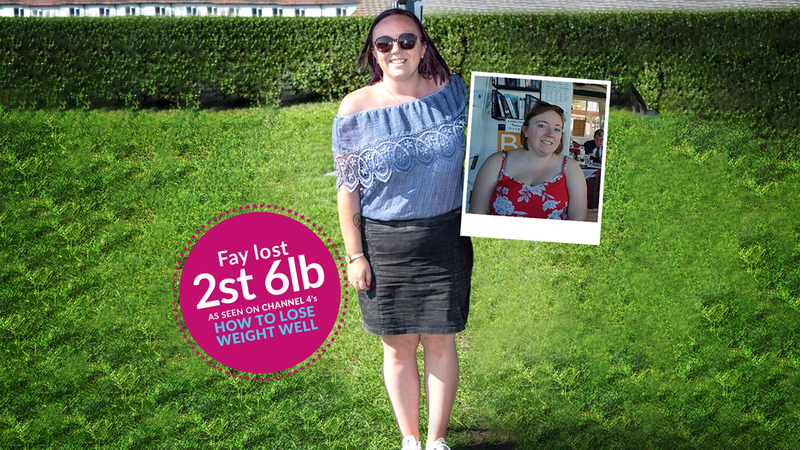 When I was told I’d be following the LighterLife programme I was apprehensive because I hadn’t heard about it and was like nothing I’d tried before. I started off on the Lite plan by having three LighterLife products a day followed by a healthy evening meal. This was a good way to introduce myself to this type of diet. I soon decided to move onto the Total plan to see a bigger weight loss each week. I replaced all conventional food with LighterLife’s total diet replacement (TDR) Foodpacks. I loved the Peanut Bar and Chocolate Shake. The products were so easy to make and took no time at all to prepare, the bars were super-convenient with my job as I could eat them on the go. In my first week I lost 4lb and I loved seeing the weight drop off so quickly, it made it all worth while. Alongside the meal-replacement products, LighterLife provides counselling groups to support you on your weight-loss journey. As there wasn’t a group close enough to my house, I decided to join LighterLife2U. It was a conference call run by a counsellor which included myself and another five ladies who were all on a quest to lose weight. Alongside my group session each week I also had a one-to-one call with my mentor, Adam, which was really beneficial. I appreciated the extra level of support he gave me from answering questions about the plan to keeping me motivated on tougher weeks. Before LighterLife I’d have come home after a stressful day at work and reached for the biscuit tin. I wouldn’t have thought twice about it. My mood really dictated my eating habits and played a big part in my weight gain. Now, I am so much more aware of my reasons for eating and I catch myself noticing my actions around food, whereas before I never paid attention. LighterLife has definitely helped me to recognise the power our minds have over how we react to food and respond to life’s obstacles.